Haven’t decided on a hotel yet? You can look at other available hotels in the Saxony-Anhalt region with Booking.com. Most visitors come to Saxony-Anhalt to relax in the Harz Mountains, but the state also offers several interesting towns filled with medieval castles, Romanesque and Gothic churches, and abbeys. Back in the Middle Ages, the region was on the frontier between the Germanic and Slavic cultures, and as the German command continued its eastward path, so too did its great building schemes. Its two names come from the union of the former Duchy of Anhalt and the part of the Kingdom of Saxony that was merged into Prussia at the Congress of Vienna in 1815. If you want to look around picturesque half-timbered German villages without the tour bus crowds that overflow some other areas of Germany (Bavaria, anyone? 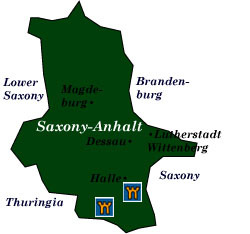 ), then Saxony-Anhalt may be the place. Lutherstadt-Wittenburg It was here where Martin Luther wrote the 95 Theses and nailed them to the church door in 1517, launching the Protestant Reformation that forever changed the face of Christianity and Europe. Luther owns this town, now more than ever, and his shadow is never far away. Start your visit at the Lutherhaus. Dessau Those with an interest in modern architecture should visit Dessau, the home of Walter Gropius’s Bauhaus school of design, one of the 20th century’s most influential art movements. The Bauhaus Building can be visited, as well as other Gropius designed buildings scattered around Dessau. Halle Despite its outward appearance of former East German blight, Halle has much to offer. Its most famous son is composer George Friedrich Handel, who was born here in 1685. The Händelhaus, the house of his birth, is now a museum. If your musical tastes run more to pop, then try the Beatles Museum, one man’s shrine to the Fab Four. Just outside of town, Burg Giebichenstein is the former home of the Magdeburg bishops. Part of the castle is in ruins and part is an arts and crafts college. Naumburg This 1,000-year-old town is famous for its Romanesque cathedral of Sts Peter and Paul. Friedrich Nietzsche and his family lived in Naumburg from 1858-1897. His home, the Nietzsche Haus Museum, presents (in German) little in the way of philosophy, but it’s big on photos and biographical texts. Freyburg For nearly a 1,000 years the large Schloss Neuenburg has reigned supreme over the town. Inside you’ll find a better-than-average museum with medieval exhibits. However, most people come here to visit one of the largest sparkling wine producers in Europe: the Rotkäppchen Sektkellerei (Little Red Riding Hood). Quedlinburg This medieval town holds the record of the most half-timbered houses in all of Germany—1,600 of them—meriting status as a UNESCO World Heritage Site. Above the town sits a big Renaissance castle, which is now a history museum with exhibits dating from 919 AD. Wernigerode Well located for excursions to the eastern part of the Harz National Park, Wernigerode is known for its timber-framed houses, a colorful Rathaus, and its fairy-tale castle—Schloss Wernigerode. Built in the 19th century on the ruins of a 12th-century fortress, it now houses an art museum. An added attraction is a steam-powered, narrow-gauge railway, which you can take along the Harz Mountains. Magdeburg Although much of this ancient town was destroyed during World War II, this capital of Saxony-Anhalt has many reconstructed buildings worthy of a visit. The dom is one of Germany’s most important Gothic cathedrals with its vast high-ceilinged interior and art collection. The cathedral also holds the tomb of Otto I.